Is there one place I can find information for my whole building? How can I compare my options for green products, systems or services? Why do some of these ‘green’ things even matter? The Sustainable Facilities Tool (SFTool) from the federal General Services Administration (GSA) can help building professionals review projects and answer those questions. Johnson Controls recently learned about SFTool from Michael Bloom, Green Buildings and Sustainability Program Advisor and Program Lead for GSA’s SFTool in the Office of Federal High Performance Green Buildings. What is the Sustainable Facilities Tool? The SFTool is a website where sustainable building practices can be learned, designed, compared and shared. Realizing that it was impossible to rely solely on trained green building professionals to support all potential green building projects, especially smaller ones, the GSA “started thinking systematically about what actions need to be taken in the sustainable building world to make a difference,” explained Bloom. Facility managers, project managers and building owners who are responsible for smaller projects are often lack the budget or project scope to bring on green building professionals. As a result, many small projects were being undertaken without specialized knowledge in sustainable design or operation. The SFTool was designed to provide “a virtual space that encourages people to explore their options, engages them in an experience of a virtual walkthrough, introduces opportunities, prompts them to ask questions, and provides them with answers that they need, all in one tool,” Bloom said. Founded on an integrative systems approach, the tool demonstrates decision-making in real time and at a virtual space based on a real building. Bloom observed that integrative design is the best process for building sustainably, but that project managers often do not understand what it means to build an integrated team and at what stages to bring specific perspectives to bear. The SFTool is a “way of modeling what it is like to build an integrated sustainable project team, and giving examples of why that would be important,” he said. From its inception, the SFTool was created for public use to address universal questions. In addition, “a driver from day one” was to be transparent about why the government has certain requirements and is investing in green building, according to Bloom. What are the components of the tool? The tool includes five main elements: Learn, Plan, Explore, Procure and Share. The Learn section “provides a baseline education on sustainability topics, much like a glossary of sustainability,” Bloom explained. He recommends it as the starting point for new users. The Plan section provides guidance to frame the type of project being proposed. It walks users through the different sections of the tool for each step of their sustainable facility project. It also introduces sustainable project strategies and guidance on specific subjects like lifecycle approach and net zero energy. The Explore section is “the heart of the SFTool,” according to Bloom. It allows users to virtually walk through different building spaces and systems, their components, and how they work with other spaces and systems. The tools keeps building professionals from being overwhelmed or paralyzed by the many choices they must make when choosing the most sustainable options, and “provides information so decision makers can act based on their priorities,” Bloom said. It makes tradeoffs clear by using comparison charts and other design guidance for the components of spaces or systems. The Explore section emphasizes integrative design and systems thinking and how systems and spaces continuously affect each other. 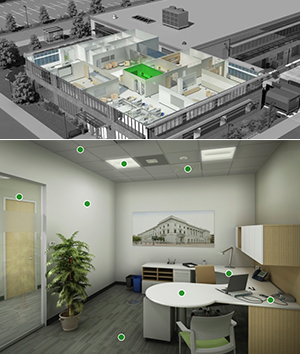 For example, Bloom explained, “Experts in HVAC are rarely experts in lighting, but those two whole building systems affect each other continuously…You need to think beyond just the limited effects of one discreet project and think of it in context of building as a whole.” The SFTool helps make the connections between building systems obvious. It also describes the impact of different choices on indoor environmental quality, natural resources, energy usage and lifecycle cost, and describes how occupant behavior and operations and maintenance practices affect building performance. Finally, the Explore section helps provide persuasive financial language for those trying to make a business case for investing in sustainable options. Finally, the Share tab will look familiar to any frequent social media user, offering updates, case studies, and tweets by @SFTool. Bloom said the GSA will continuously develop and pull information into this section from other social media outlets, such as Facebook and Pinterest. For whom was the tool designed? In addition to the five elements, the SFTool features tailored user guides for facility managers, leasing specialists, procurement professionals and project managers. The content is framed to show those in each role how the concepts apply to them, depending on what they care about most. At the same time, the tool is user-friendly, relevant and understandable to almost anyone with any level of exposure to green building. The SFTool is a repository of information for all components of green building – spaces, systems, services and products. It helps users from all backgrounds make decisions about the best fit for their project or facility. The tool goes beyond simply educating users, helping them compare and weigh options, evaluate progress, and plan for the future. What’s more, it open to the public to draw upon a wealth of information to identify opportunities and create a set of solutions for building and operating green facilities.